DENVER, CO. — Denver All-Pro Wide Receiver Demaryius Thomas held his Demaryius Thomas Football ProCamp presented by SunnyD for football instruction and fun on July 18th-July 19th, 2015 at Mullen High School located at 3601 S Lowell Blvd in Denver, CO. 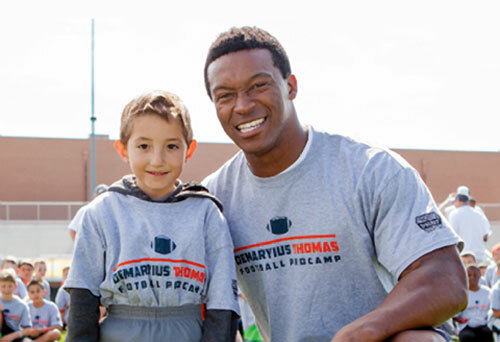 The Demaryius Thomas Football ProCamp was 9:00 am to 12:30 pm for grades 1 – 8. Throughout the camp Thomas offered tips and instruction, highlighting the finer points of football. Participants experienced various stations specializing in fundamental football skills and will participate in touch football games. Participants were placed in small groups according to age to ensure that each child gets maximum instruction. Demaryius Thomas is a wide receiver for the Denver Broncos. Thomas was selected by the Denver Broncos with the 22nd overall selection in the 2010 NFL Draft. He is known for his physical style of play and run after catch ability. He was 2nd in the NFL for catches over 20+ yards and 5th in yards after catch in 2012. He was selected to his first pro bowl in 2012. If you would like to book Demaryius Thomas for a speaking engagement or appearance, contact Demaryius Thomas’s booking agent at Sports Speakers 360 for appearance & speaker fees or call toll free 1.855.303.5450.